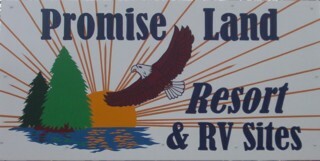 Larry & Margie want to welcome you to PROMISE LAND RESORT on beautiful BULL SHOALS LAKE in the Ozark Mountains! The resort known for it's view!! We also have a crappie bed that runs about 40' long...we put in over 24 trees there last fall (10/2005) , we will be happy to show you where it is. We added additional trees this year (01/2008) making it over 30 trees so far. Fish finders are marking fish on it. 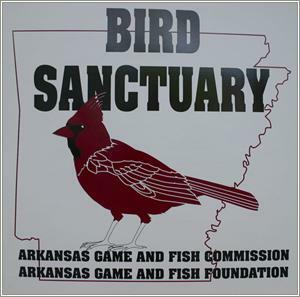 For you tournament fisherman we are only 1 mile by water from Bull Shoals Marina....and have electrical outlets at the cabins for charging your batteries. Just one of the lake views that we have ....isn't it grand? We hope that after you stay with us you will return to Promise Land Resort again and again. Whether you are alone, with your family, friends or your long-awaited family reunion, corporate or church retreat, we have a cabin for your accommodations. We have a sleeping capacity of up to 48 guests, and if your group is larger than that we will work with neighboring resorts to accommodate you...and we have access to a local community center with full kitchen facilities. Cabins sleep from 1 to 12 guests, depending on which one you select. We offer 3 cabins with 2 bedrooms, two studio cabins, and 3 cabins with one bedroom, and an all open Honeymoon/Anniversay cabin with a 2 person heated Jacuzzi and electric fireplace. All cabins are recently remodeled and furnished, including new 19" color TV's, and DVD players, microwaves, coffee makers, toasters, new appliances, complete kitchen utensils, bathroom w/shower etc. All you need to bring are your beach towels and food. Many local area attractions are just minutes to a couple hours away, Like BRANSON, caves, fish hatchery, golfing, Top of the Tower, 1890 Village, antique shops, fine dining, Museums, hiking trails, biking trails, horse back riding, and more. July 4th you can watch the fireworks from our resort, we are directly across the lake from them. Paved roads will bring you right to our door.....We are the last resort on our road, with the next stop, the lake. Plenty of parking for your boat and only seconds from a concrete boat ramp. Come and enjoy the lake and/or river....then come back and use our Recreation Room/Sunroom, with a beautiful fireplace, pool table, ping pong, game tables, along with seating for 25+ guests, for your business or church meeting. We will be happy to arrange a complete package at reasonable rates for you or your group. On the patio, located in front of the Sunroom is a large smoker and grills that you are welcome to use also. There is also seating for 25+ guests on the patio for an enjoyable picnic. We take pride in being the owners of Promise Land Resort. 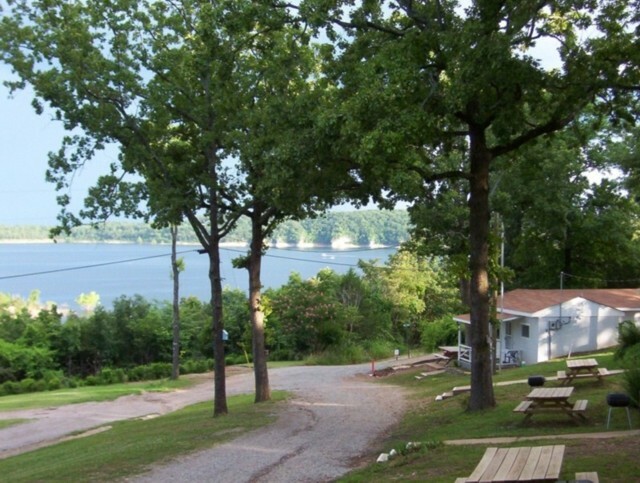 Promise Land Resort was the first resort built in the Promise Land Area of Bull Shoals Lake. The beauty of our gentle sloping grounds and the cleanliness of our accommodations will make your stay most enjoyable and relaxing. Sit and watch the birds, squirrels, chipmunks, fox and deer play on our grounds. And watch for eagles in the Fall! 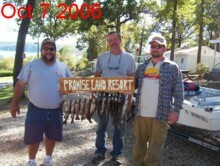 Guided fishing trip on Bull Shoals Lake $250 gas & bait included, no extra charges. We have pileated woodpeckers, painted buntings, blue indigos, warblers and more. We have had guests tell us they have seen over 30 species at our resort. Snowbirds call us about special weekly and monthly rates on cabins and RV parking. We have been environmentally conscious for some time. Here are just a few of the items we do or have. Light bulbs have been replaced with low wattage usage bulbs, low flow shower heads, 2 trash containers in each cabin - 1 for recycling aluminum, no smoking inside cabins, hot water 125-135 degrees, extra blankets are provided in the cool season, we buy resort supplies locally, many mature shade trees located on our 5 acres, as needed we are replacing toilets with low water usage toilets, as needed we are replacing with energy star appliances and we will continue to think green!!!! Check out these links for further area information.